For other uses, see Obsidian (disambiguation). A piece of rainbow obsidian. Glass Mountain, a large obsidian flow at Medicine Lake Volcano. Obsidian is a natural volcanic glass found as a kind of igneous rock. It is produced when lava high in silica (SiO2) cools rapidly, and solidifies without time for crystal growth. 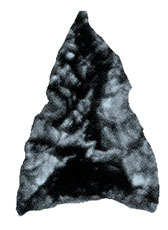 Because there is no crystal structure, obsidian blade edges can reach almost molecular thinness, leading to its ancient use as arrowheads, and its modern use as surgical scalpel blades. Obsidian is mineral-like, but not crystalline. It is dark in color like basalt. It consists mainly of SiO2 (silicon dioxide), usually 70% or more. Obsidian does not last forever. It is metastable: it changes very slowly. Over time, the glass becomes fine-grained crystals. So, no obsidian is older than Cretaceous age. It breaks down faster when water is present. Obsidian has little water, but takes it in if it sits in groundwater. Usually dark, the color varies on the presence of different materials. Iron and magnesium typically give the obsidian a dark green to brown to black color. A few samples are nearly colorless. In some stones, small crystals produce a snowflake pattern (snowflake obsidian). It may contain patterns of gas which produce effects such as a golden sheen (sheen obsidian) or a rainbow sheen (rainbow obsidian). Pre-Columbian Mesoamericans' used obsidian often. It was worked for tools and decorative objects. It was also polished to create early mirrors. Mesoamericans also made a type of sword with obsidian blades mounted in a wooden body. Called a macuahuitl, the weapon could cause terrible injuries, because it combined the sharp cutting edge of an obsidian blade with the ragged cut of a serrated edge. Modern archaeologists have developed a dating system to calculate the age of obsidian artifacts depending from the content of water in the object. Obsidian can be found where high silicate eruptions have happened. There are solid obsidian flows in the calderas of Newberry Volcano and Medicine Lake Volcano in the Cascade Range of western North America, and at Inyo Craters east of the Sierra Nevada, California. Yellowstone National Park has a mountainside containing obsidian between Mammoth Hot Springs and the Norris Geyser Basin. Deposits can be found in many other western US states including Arizona, Colorado, Texas, Utah, Oregon and Idaho. Obsidian can also be found in Armenia, Turkey, Italy, Mexico, Iceland, Greece and Scotland. Pig carved in snowflake obsidian, 10 centimeters (4 in) long. The markings are spherulites. Obsidian is used in heart surgery, as well-crafted obsidian blades have a cutting edge many times sharper than high-quality steel surgical scalpels, with the edge of the blade being only about 3 nm wide. Even the sharpest metal knife has a jagged, irregular blade when viewed under a strong enough microscope. When examined under an electron microscope an obsidian blade is still smooth and even. One study found that obsidian produced narrower scars, fewer inflammatory cells, and less granulation tissue in a group of rats. Obsidian is also used for ornamental purposes and as a gemstone. It possesses the property of presenting a different appearance according to the manner in which it is cut. When cut in one direction it is a beautiful jet black; when cut across another direction it is glistening gray. ↑ Obsidian is found in rhyolitic lava flows known as obsidian flows, where cooling of the lava is rapid. ↑ "Perlite - Mineral Deposit Profiles, B.C. Geological Survey". Retrieved 2007-11-20. ↑ Obsidian was also used on Rapa Nui (Easter island) for edged tools such as Mataia and the pupils of the eyes of their Moai (statues). ↑ "A comparison of obsidian and surgical steel scalpe...[Plast Reconstr Surg. 1993] - PubMed Result". Retrieved 2007-11-20. Wikimedia Commons has media related to Obsidian. This page was last changed on 12 September 2018, at 08:08.